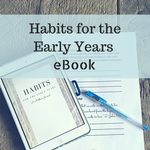 For years, I've been eager to start those infamous formal lessons, but as soon as Miss H turned six, I felt myself shrink back a little, like a groundhog from his shadow. I didn't want to let go of these beautiful years, this quiet growing time. And, since I still have two boys who will linger in the early years for much longer, I wasn't sure I wanted an intense curriculum that my little ones would be completely excluded from. So, I spent time praying about our curriculum choices, and do you know what occurred to me? Charlotte Mason laid out what formal lessons should look like in Home Education. I don't necessarily need to consult other curricula, I need to consult that volume. I don't need to copy her PNEU school schedules, I need to narrow in on what she said about home education. There are Parents' Review articles, schedules, letters, tributes....there is so much I could pull from. But her first volume is enough for this mom who wants to cherish these little years. I spent some time in Charlotte Mason's first volume again, this time paying closer attention to what she said about formal lessons. Using those recommendations, I put together a curriculum for Miss H, one that I think will delight her, and allow her brothers to listen along. A friend asked me how I made choices in certain areas, and the answer, every time was, "Based off of Home Education." I didn't consult any other resources, although I will most likely base the schedule off of what I was familiar with as a teacher. Science- I had so often heard that we should wait for science until closer to junior high, but Charlotte Mason recommended reading a science book with children ages 6-9. I know my husband, and Miss H, will be ecstatic about that. Geography- There's often a debate about whether or not to start with the history of our own country, at least in America, because of America's relative babyhood. But in this volume, she recommended reading about famous people from history rather than chronologically going through an entire nation's history. Integration- In my mind, I so often viewed all the different subjects of a Charlotte Mason education, but in this volume, she doesn't include so much separation between areas. She mentioned reading Shakespeare for history, literature for geography, poetry for reading lessons, etc. This to me feels like that I didn't need to pick so many books, because the areas will overlap. "Judicious skipping"- Homeschool moms often look for books that are virtuous and contain nothing offensive, which, because of cultural differences is sometimes hard to do. I appreciated how Charlotte Mason recommended "judicious skipping" when reading some books aloud to young children, because it took the pressure off of picking a perfect book. It's okay if some of the content is not appropriate for a six-year-old, because we can skim over it instead of sharing it with them. Copywork- Copywork is mentioned at the age of seven. I always assumed this was a right-off-the-bat sort of thing, since so many consider copywork sufficient for handwriting practice. With these things in mind, here are the choices that I made for our curriculum. I hope to follow this framework for future years, at least until we have another little one entering into formal lessons. As you've probably gathered by now, I view Charlotte Mason's recommendations as possibilities instead of requirements, so there were a few areas that I had to make adjustments because of book availability and appropriateness. Charlotte Mason listed a handful of poems that children can memorize, but we will choose poems from our poetry book. Although Charlotte Mason gave some simple grammar lesson suggestions, we will just include grammar by-the-way. CM recommended learning basic grammar concepts like noun, verb, and complete sentences at this age. Talkbox Mom, French (Similar to Gouin's series, where whole, relevant phrases are taught.) You can use the referral code REFVH6Y7G4ITQ for $15 off. Formal lessons for these areas aren't described, but will be added to our morning time. Music- Music is mentioned in the part about the early years. It should fill the atmosphere with ideas. But, there are no recommendations for how to teach it outright. So, we will use this book, The Story of the Orchestra, to guide our listening. I put this curriculum together not to be as Charlotte Mason as possible, but to fulfill the need I often find within me to figure things out on my own, so that we are doing something that truly fits our family's unique needs. If this curriculum fits your family's needs, I hope that you'll use it and enjoy it. You can print off a free booklist by subscribing above. I hope you'll read more about the recommendations in each subject as I continue this series! Yay, We use many of these, excellent choices! Singapore doesn’t teach complete number sense? I disagree with your teacher friend but mathematical games and supplements are key to learning cohesiveness. Thanks for this great resource, excellent, wise mama! Thank you for your kind encouragement! My friend said I needed to be sure to keep using the concrete examples (with math manipulatives) even when the book moves on to be sure to cement that number sense. I used the Common Core version of Singapore Math when I taught first grade, and I do remember spending a lot more time on counting, etc. But math games would be really fun to add in! Thank you for mentioning it! I like the idea of using exactly what Ms. Mason outlined in her Home Education Volume 1. Very helpful!! Was a little disappointed in the coupon for Talkbox though 🙁 I wanted to order the book only, but the code is only good for minimum orders of $100. That’s not in the budget for now so maybe another time! Leah, thanks again for all your wonderful post about Charlotte Mason’s Early Years!!! I’m so glad to know that I’m not alone in wanting simplicity with my little ones! I don’t want my son to feel left out either, especially because he has a late birthday and will be nearly six before he’s even considered in “kindergarten.” I hope this allows him to listen in when he wants! How cool that you all are studying German! Help! I Don’t Like Playing With My Kids!